The Art Walk is making plans for a “Love La Habra” event. On April 29, 2017 hundreds of volunteers will be scattered around the neighborhood to show unity and love. Pre-selected areas will be cleaned up and beautified. The board of the La Habra Art Walk wondered what we could do to help the Washington Middle School. What can the Art Walk do that will 1) promote art, 2) engage the community and 3) help the school? Do we paint the walls? Do a mural? Do we paint signs? Raoul Pascual came up with Fence Art. Raoul will design the artwork and groups of children/volunteers will be assigned sections of the fence. 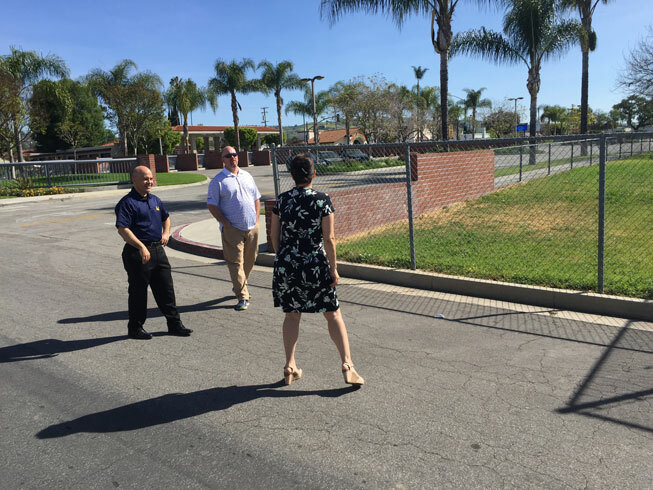 With the help and encouragement of Michelle Bernier we consulted with Principal Mario Carlos who said the neighborhood (which is mostly Hispanic) is nervous about the INS (Immigration and Naturalization System) and are afraid to join public gatherings. He wants the community to feel safe and have a purpose. Carlos said he wants the kids to look forward to college. 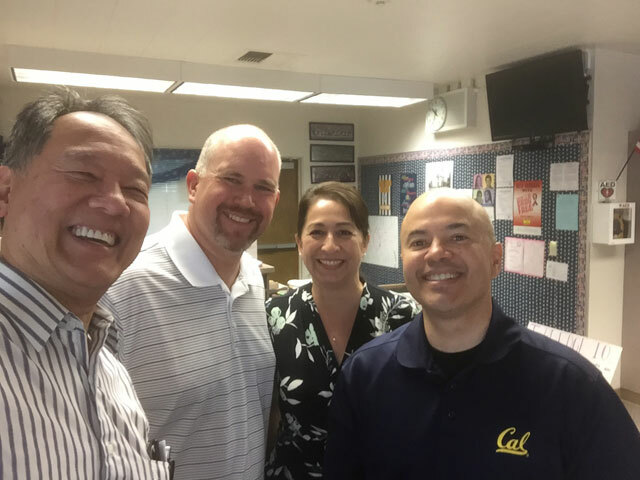 Raoul Pascual, Jeff Bernier, Michelle Bernier and Principal Mario Carlos. Raoul developed a concept of putting colored cups on the perimeter fence. 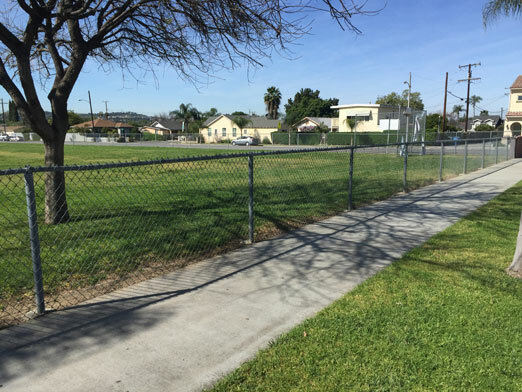 According to Raoul he has “seen it in some fences but I have never really done this but in theory, the plan should work.” Originally, the concept was to design a fence with children running and even having an animation that can be seen at night. After some preliminary calculations Raoul decided it would be too ambitious for the first attempt. Then Raoul thought of a train with a long caboose with the name of the school. 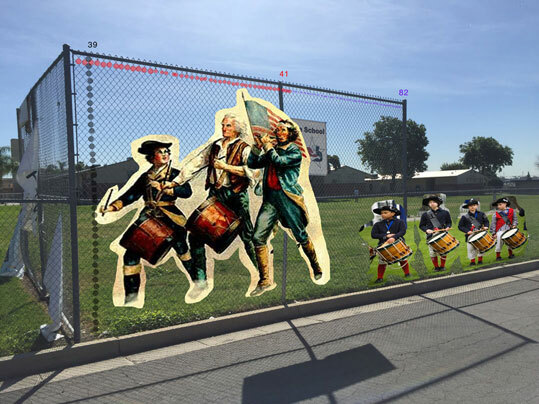 But after the talk with Principal Carlos we learned that their mascot was “The Patriots.” So we adjusted our idea to have the famous painting of the marching patriots translated into “pixels” — where one slot of the fence equals one pixel. Here is the projected pixel artwork. It took several hours of experimentation but we believe we’re ready for March 29. If you’re in the area and not busy, come and join us. It should be quite an experiment. The Art Walk board will be doing the more complex main fence and will supervise the other fences. Volunteers will be handed a template and provided with “plastic cups.” (Michelle discovered that regular drinking cups will not fit in the fence holes so she is ordering special “put-in cups”). We recommend you form teams of 5. Each team should assign a leader who will call the shots of where to place the cups. Raoul will be there to assist and advice your creation. 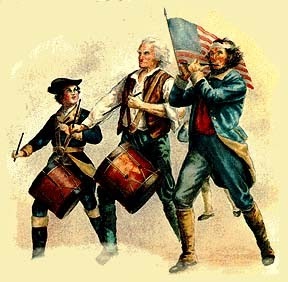 C’m’on down and make your city proud!